Discover goos, brews, potions, and other concoctions that you can whip up at home to get you and your kids in the mood for Halloween! This post was originally published in 2014, updated with new graphics and links. 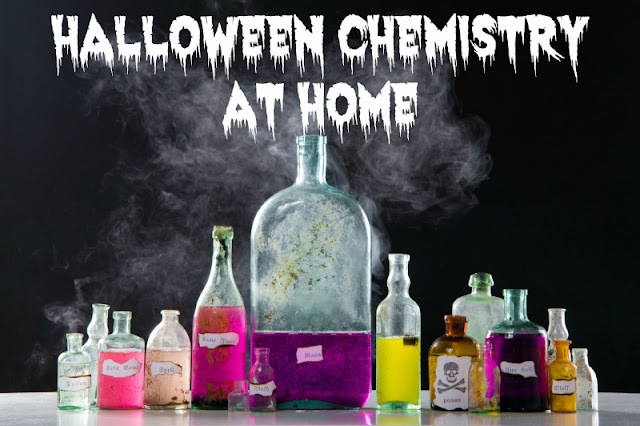 You don’t need much for potion making – just a few containers (fancy containers work best), food coloring, vinegar, baking soda, and imagination. My daughter went wild making potions of her choice. Good old vinegar and baking soda again, but Blog Me Mom upgraded a “spookiness factor” by adding themed containers and black tempera paint to her spooky Halloween eruptions. Growing a Jeweled Rose is a queen of glow play. The “magic ingredient” in most of her mixtures is glow water, which looks amazing but surprisingly easy to make. Also from Growing a Jeweled Rose comes an extension of glow water – a mysterious goblin goop – perfect for Halloween! Regular play dough is too boring? 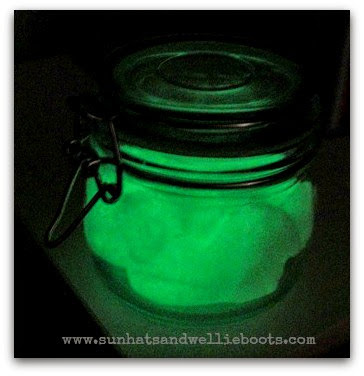 Enchant your kids by this glow in the dark homemade playdough version from Sun Hats and Wellie Boots. Don’t throw out pumpkin guts! Make a pumpkin slime instead using this pumpkin slime recipe from Learn Play Imagine. Another recipe for pumpkin guts comes from Inspiration Laboratories. This time they are mixed with water and cornstarch to make pleasantly smelling pumpkin oobleck. There is something magical in microwaveable puffy paint. Fun At Home With Kids shares a perfect fall scented puffy paint recipe for pumpkin and apple puffy paints. Gross out your kids or party guests with this jelly messy play from Nurture Store. Dry ice bubbles create a proper atmosphere and infinitely fascinating for scientists big and small. This activity from Not Just Cute is definitely on our list of things to do! Do not limit yourself to red paint! Steve Spangler Science offers proper fake blood recipes and discusses the differences between them. Let it flow! This jell-o blood worms from The Idea Room will be a cool addition to a Halloween party or to sensory play. Don’t they look disgustingly real? I am still undecided whether I want to try them or not! Do you have a favorite Halloween concoction– edible or not? Share yours here or on my Facebook page. Follow my Pinterest board Halloween. Follow Natalie Planet Smarty Pants's board Halloween on Pinterest. My brother used to obsessively make fake blood and then make movies using large amounts of that fake blood. This couldn't have come at a more perfect time. My daughter has been on a major science experiment kick. Thank you! Those dry ice bubbles are great! Get some round ice cube trays and freeze blueberries in water in them. Then float those eyeballs in Halloween punch. Buy some fresh carrots. Cut them into finger sizes. put peanut butter on the nail bed, and use the peanut butter to glue red apple peel cut into a fingernail. Eat that! People shudder, but they go for it. These are great! I can't wait to try some of them! I am featuring this post on Saturday Science! I love all of your ideas. They are so awesome and look so fun to do. I LOVE all these ideas, thank you so much! 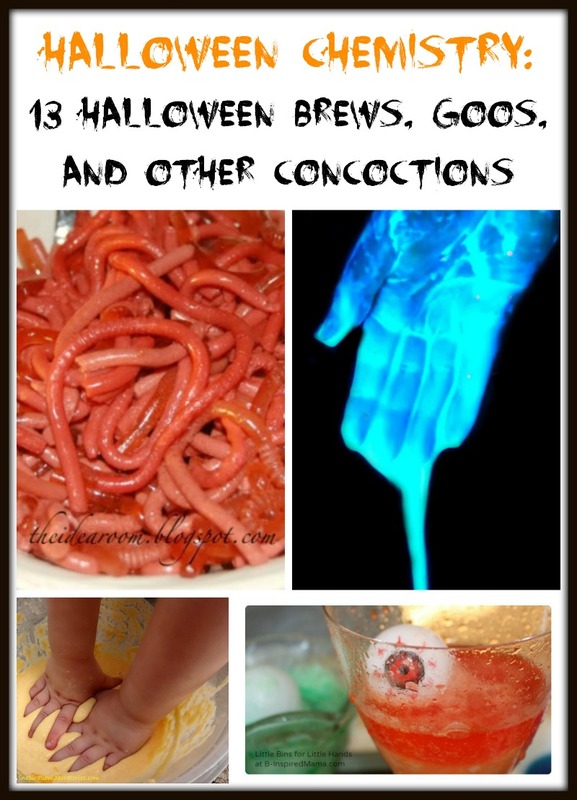 These are all fun Halloween activities! Why Are We Hesitant to Speak Up for Our Kids?